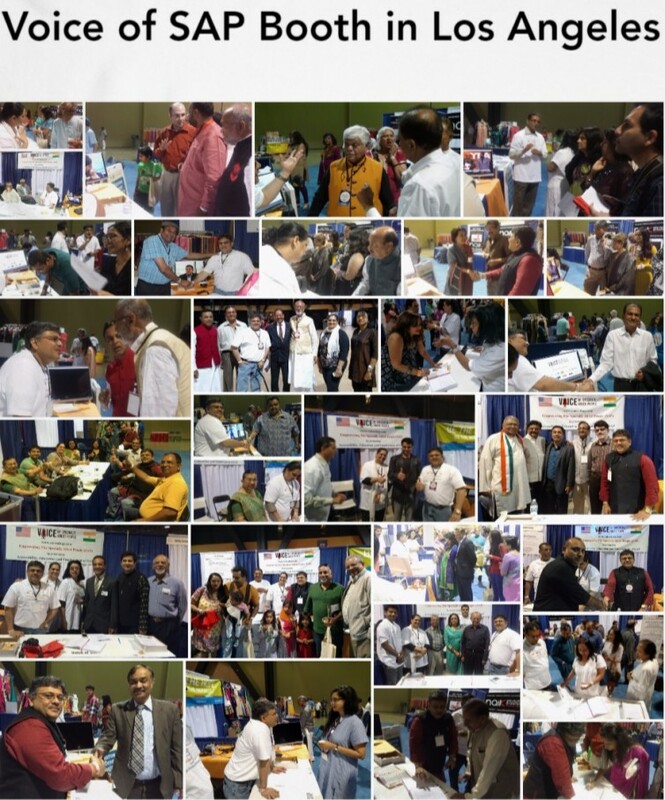 Voice of SAP had a booth at Gujarat Mahotsav 2016, held in Los Angeles on June 18-19 2016. In this 2 days event, couple thousand Gujaratis attended the event and hundreds of them took deep interest in activities of Voice of SAP. Over 100 people offered their support and registered as volunteer at the event. We sincerely thank the organizers Shri Pravin Patel and Shri Sharadbhai Mehta for the opportunity to VoSAP. Among many new supporters, Devang Patel (singer), Dinkar Mehta (Comedian), Kaajal Oza Vaidya and Jay Vasavda (motivational speakers) were inspired to take the message of VoSAP to their fans including offering to do charity events benefiting the VoSAP cause. VoSAP mission was strengthen further by receiving strong support from local community leaders such as Shri B. U Patel, Shri Pradeep Dalal, Shri Dinker Shah, Dr Suresh Jani, Shri Keshav Patel, Shri Rashmi Shah, Shri Govind Vaghasia, Dr Nitin Shah, Shri Naresh Solanki (Mayor Pro Tem of Cerritos, CA), Dr Ushakant Thakkar, Dr Vikram Kamdar, Shri Amit Desai, Dr Jay Shah, Shri Adhir Shah, Dr Dhiren Buch and several others. VoSAP team will work closely with these leaders and supporters with follow up actions and projects as discussed during these 2 days. Success of this event has inspired VoSAP volunteers in the US and India to participate in similar other events to spread awareness and expand volunteer base in local communities to join for Social Transformation in India for SAP.